Here's an interview I recently did with Chelsea Haines for Guernica Magazine of Art and Politics covering the challenges of focusing on Palestine in Pittsburgh and a call for arts funders to stand behind freedom of expression. Following popular sitcom vernacular, The Sitcom revolves around one family, which exists in two places simultaneously. One version of the family is located in Tehran, the other version in Los Angeles, and the same domestic production set is constructed in both cities. In each city, the family is performed by local actors speaking their local language. In the finished episodes, the action moves back and forth between the American and Iranian versions of the family, so that the plotlines and jokes that are developed in one are carried forward and furthered in the other. In the end the series will be designed to construct a third space, a place that hovers between two specific cultural conditions, both familiar and destabilizing to each. Carole Brown Established Artist Achievement Award: What I did with the money and what I proposed to the funders. Yesterday, I received the Carol Brown Established Artist Creative Achievement Award, an unrestricted cash prize of $15k jointly funded by the Heinz Endowments and the Pittsburgh Foundation. 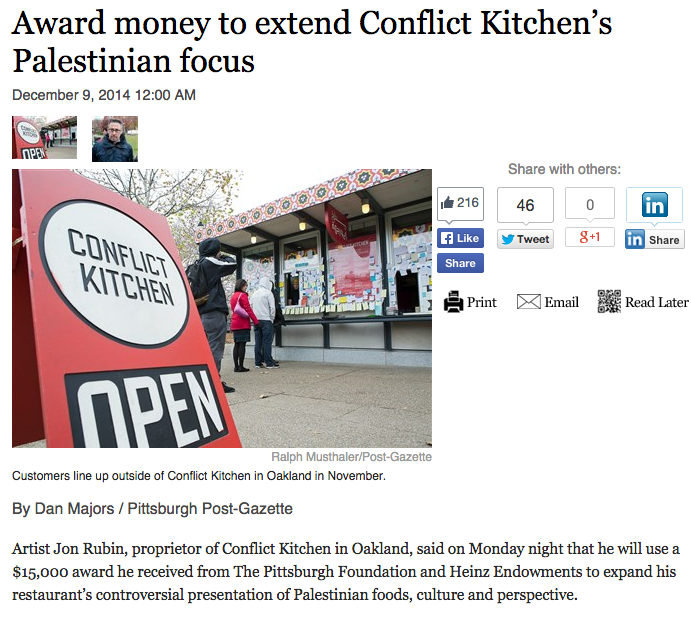 Last month, the Heinz Endowments disavowed their 2013 grant to Conflict Kitchen under pressure from lobbying groups and media organizations. In the awards speech I delivered last night I declared what I will do with the money and what I propose for the foundations to do. I’ve always felt that art has the capacity to turn the everyday into something unfamiliar and new again; to challenge our complacency, and offer us an opportunity to be present, to take greater wonder in our daily lives. It can also take us outward, to what is foreign, and uncomfortable, and make it feel familiar, expanding our personal identity to include the experiences and lives of others. What does it mean to support an artist? And what role does a funder play in this equation? Does the relationship end when the check has been delivered, or is that simply the start? And on whose behalf do the funders work? This brings me to the Palestinian iteration of Conflict Kitchen. Since we opened this version, almost two months ago, we and our supporters have come under fire from several powerful lobbying groups that want to diminish or even silence our presentation of the lived experiences and viewpoints of Palestinians. In the 5 year history of Conflict Kitchen there has never before been a call to condemn its mission. Is the voice and culture of Palestinians more threatening or less valuable than that of the Cubans, Afghans, Iranians, North Koreans, and Venezuelans we have focused on? What does it say to our local Palestinian community that their culture and viewpoints are asked be silenced or at best mitigated by a pro-Israel perspective? Perhaps it is hard for some people to hear that Palestinians are not happy with Israeli policies. But to cast their viewpoints as hate speech, anti-semitism, or even “anti-Israel propaganda” is to reinforce the simplest, most polarizing, and dehumanizing reading of their lives. Conflict Kitchen has created a platform in the public square for voices that American society doesn’t always want to hear. They can feel foreign, unfamiliar, even uncomfortable, but what does it say about us if we cannot include them into the greater narrative about who we are? All of these efforts were in stark contrast to the massive interest and support we were receiving, and continue to receive, from the public on a daily basis. As an artist who has been funded by the Endowment in the past and stands before you getting funding again, I don’t need to tell you how deeply unsettling and destabilizing these statements are. The Endowment had reinforced the bullying tactics of powerful lobbying groups and has created a less-secure environment for their funded project to do its work in. Better, certainly. But you can not have it both ways. Now, I have no problem with outside organizations and individuals critiquing or challenging the methods of our project, that’s part of the nature of making work in the public sphere. But I do take issue when individuals and organizations seek to police and silence speech. The counter to the call for less speech, should always be more speech. Okay, so I’m going to propose something that seems pretty obvious, but from the research I’ve done, I don’t think it exists. I’d like to make a simple proposal that the Heinz Endowments, and for that matter all our local foundations and funders, add a freedom of expression clause to their bylaws, or policies, or contracts or whatever it is that you use to indicate your core principles. Wouldn’t this be great? Heck, my own university has a policy, and trust me, it’s come in pretty handy for them over the past month. It seems a really easy and safe thing to do. It protects the shared space between a funder and an artist and insulates that relationship from the influence of monied interests, lobbying groups, and politics. The funders will no longer have to parse their words, backtrack, or say one thing to one group and another to another. One statement, freedom of expression, end of story. Actually, the statement now on the Endowment's website, that I just read to you, could serve as a good starting point. To that end, I’ve put a lot of thought into what to do with the money from this award. And I have decided to put it entirely into the current Palestinian version of Conflict Kitchen. The byproduct of this is twofold: First, the money will allow me to bring more Palestinian voices into our city and add greater depth to an iteration of the project that I very strongly believe in; and second, this will provide a great opportunity to the funders of this award to stand up against the criticism that will certainly come again their way because of the use of these funds. Could be a great opportunity to try out that new freedom of expression clause. Listen, I think what I’m proposing is doable, and I hope this is just the start of a larger conversation about how funders and artists in our community can work together on this challenging issue. Postscript: After the speech several local funders indicated that they will consider adding a freedom of expression clause to their language. A panel of artists and arts organization leaders has announced this year’s winners of the Carol R. Brown Creative Achievement Awards, one recognized as an emerging artist with potential for significant future work, and a second artist, already established, to be cited for a body of critically acclaimed work. Conceptual artist Lenka Clayton will be honored as Emerging Artist and interdisciplinary artist Jon Rubin will be honored as Established Artist at the third annual awards ceremony and reception, Dec. 8, at 6:30 p.m. at the New Hazlett Theater Center for the Performing Arts. Each will receive a cash award of $15,000 in recognition of exemplary artistic achievements and promise for future work. The Achievement Awards program is jointly sponsored by The Pittsburgh Foundation and The Heinz Endowments as part of Investing in Professional Artists: The Pittsburgh Region Artists Program, a major initiative that provides resources to professional artists for the breadth of the creative process, from concept to completion. A somewhat misleading post on The Last Billboard as the project is not "Completely Controlled By Internet Strangers."